For U2’s second video shoot, Meiert Avis took the October album cover and brought it to life. 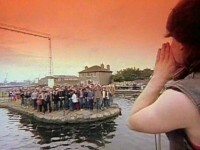 This video was filmed on a barge in the Grand Canal Docks area in Dublin. The video opens with what appears to be an underwater shot of U2 above the water. 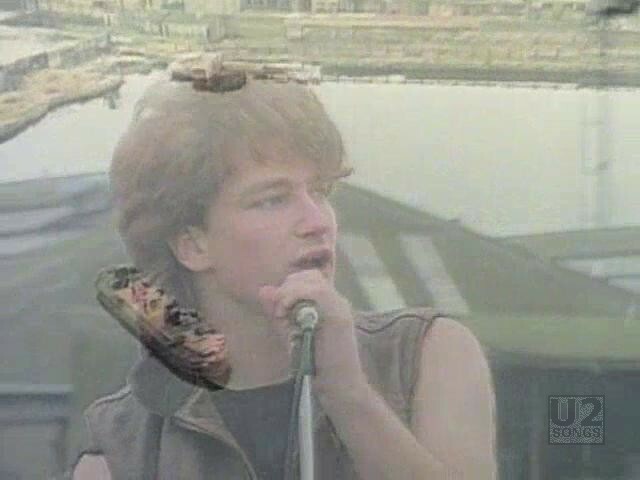 Then as the video moves above the water level we see U2 performing “Gloria” on the same docks that the photo for the cover for October was taken. 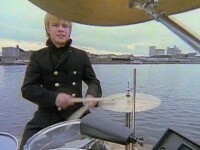 For the first minute, the focus is on the band itself and you are unable to tell they are out in the water, but an overhead shot at 1 minute in clearly shows that they are on a barge, in the water although some of the close up shots suggest the bulk of the footage was filmed much closer to the shore. During the last minute of the video we see that a crowd has started to gather. First some kids blowing bubbles, some guys dancing on a mast, and then a bigger crowd dancing. 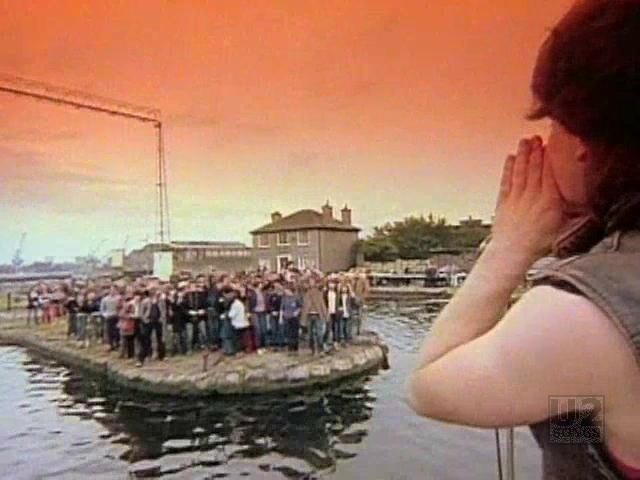 This is interspersed with a couple of shots of U2 walking through the docks, and Bono using a crowbar to gain entrance to the docks. The sky is tinted orange for the latter part of the video, although it clearly still is blue as seen in the reflection. Meiert Avis related the story of how U2 found him to work on their very first video: “I helped Brian Masterson build the music studio that U2 recorded in. When they weren’t recording, they’d come upstairs to my edit bay. It would be three in the morning, I’d be up there playing with images. When it came time to do a video, the only person they knew who knew anything about video was me, so then I got to shoot it. We got money to shoot their first videos. That’s how that all began.” Windmill Lane where much of the recording took place, was just across the water from where this video was filmed. Those familiar with Dublin will know this area as the area in which U2 currently have their studio. 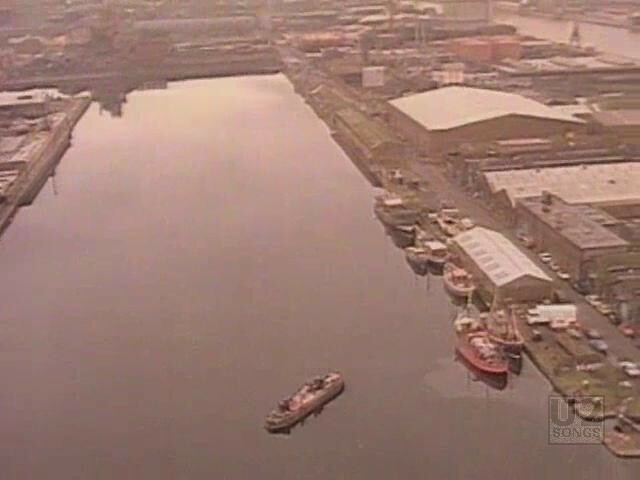 Although the area has grown up significantly since this video was filmed there are still some buildings visible in the building that are there today including the studio known as HQ, or Hanover Quay. 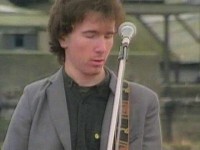 The video has never been released on any commercial U2 video release. 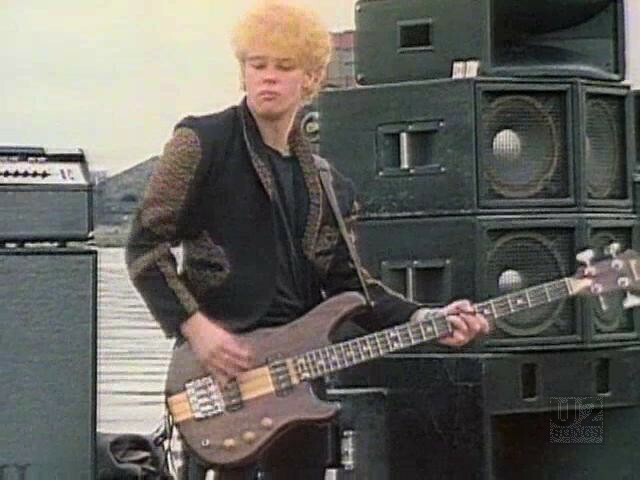 The audio track used for this video is the same that was used for the album. “Gloria” was the first U2 music video to receive heavy airplay on MTV in the US as not many acts had videos prepared when MTV first launched in August 1981. 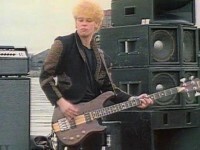 The video was filmed and released just a few months after MTV launched. 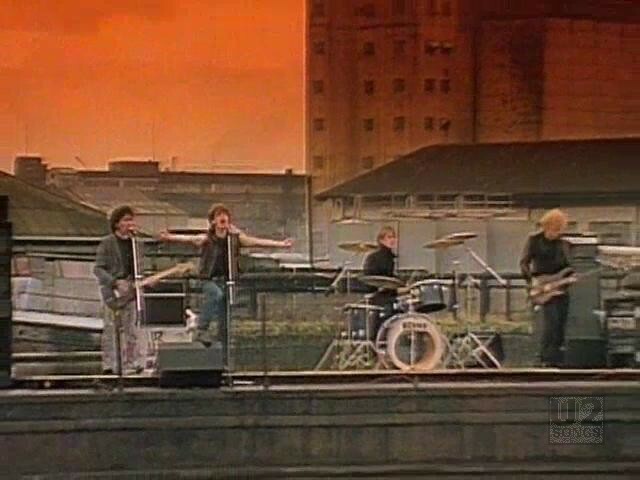 "U2 - “Gloria” Promotional Release"
"U2 - “October” Album (Original Release)"
"U2 - “October” Remastered Album (2008)"